Relative to its size the Raspberry Pi is a powerhorse of a computer -- it can drive HDMI displays, process mouse, keyboard, and camera inputs, connect to the Internet, and run full-featured Linux distributions. But it's more than just a small computer, it's a hardware prototyping tool! The Pi has bi-directional I/O pins, which you can use to drive LEDs, spin motors, or read button presses. 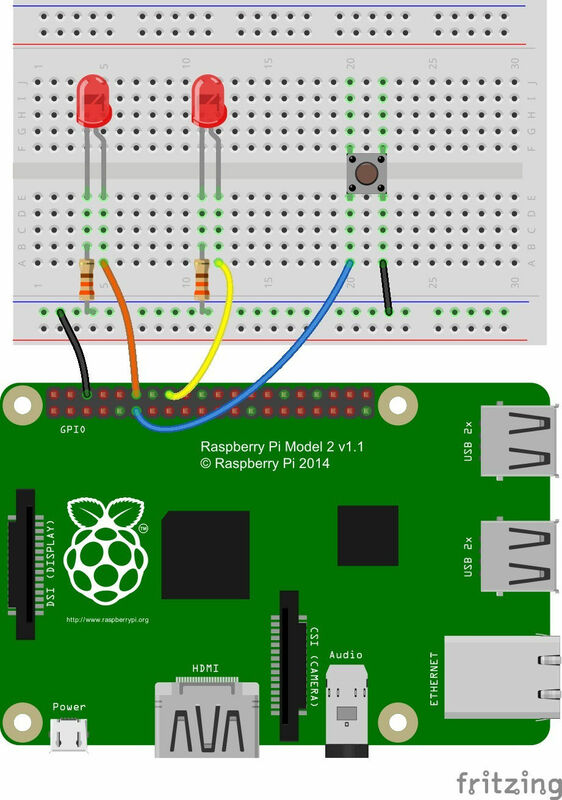 This tutorial applies to the Raspberry Pi Model B, the Raspberry Pi Model B+ and the new Raspberry Pi 2 Model B. Driving the Raspberry Pi's I/O lines requires a bit of programming. Programming in what language? Take your pick! 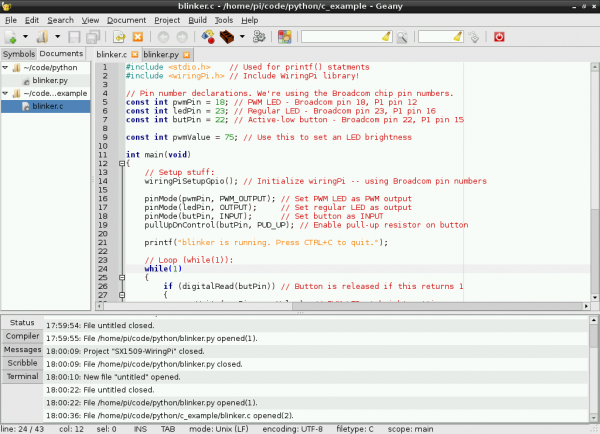 A quick glance at the Raspberry Pi GPIO examples shows that there are dozens of programming-language-choices. We've pared that list down, and ended up with two really solid, easy tools for driving I/O: Python and C (using the WiringPi library). 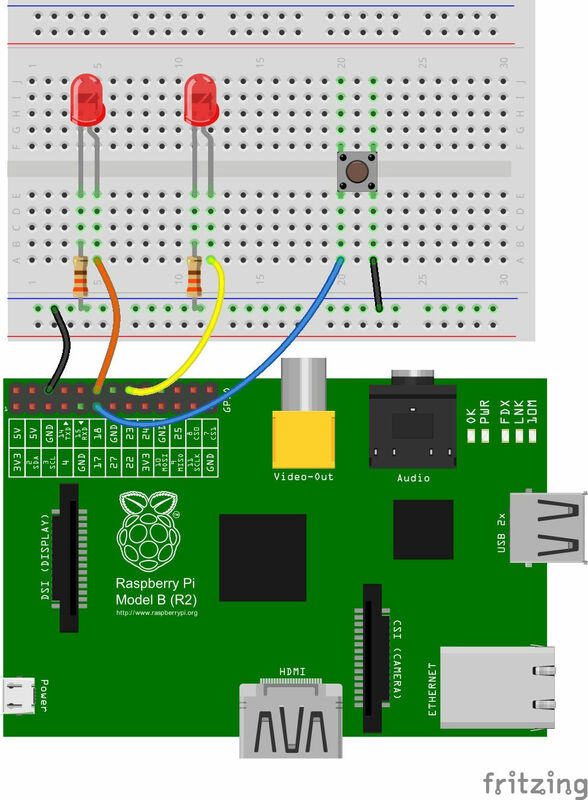 If you've never driven an LED or read in a button press using the Raspberry Pi, this tutorial should help to get you started. Whether you're a fan of the easily-readable, interpretive scripting language Python or more of a die-hard C programmer, you'll find a programming option that suits our needs. 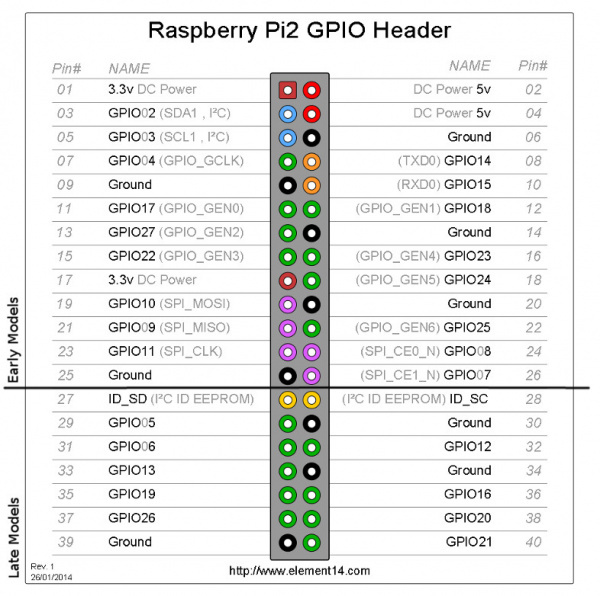 GPIO Pinout -- An overview of the Pi's GPIO header. RPi.GPIO API -- An overview of the Python functions you can use to drive GPIO. RPi.GPIO Example -- An example Python script that shows off both input and output functionality. WiringPi Setup and Test -- How to install WiringPi and then take it for a test drive on the command line. WiringPi API -- An overview of the basic functions provided by the WiringPi library. WiringPi Example -- A simple example program that shows off WiringPi's input and output capabilities. 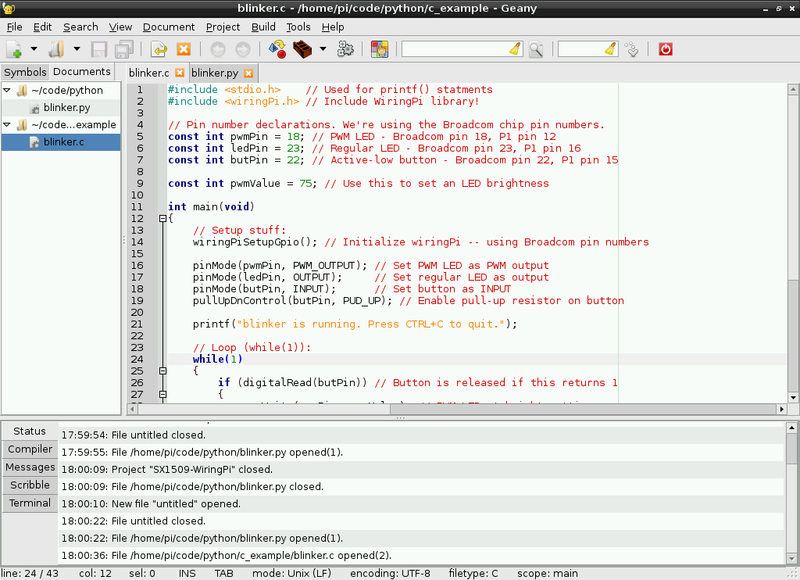 Using an IDE -- How to download and install Geany. Our favorite IDE for programming on the Raspberry Pi. Each programming language has it's share of pros and cons. Python is easy (especially if your a programming novice) and doesn't require any compilation. C is faster and may be easier for those familiar with the old standby. Here's a wishlist-full of everything we used for this tutorial. Your Raspberry Pi should have an SD card with Raspbian installed on it. Check out our How to Install Raspbian tutorial for help with that. We're also assuming you have the necessary mouse, keyboard and display hooked up to your Pi. Your Pi will need an Internet connection to download WiringPi. You can use either Ethernet or WiFi (check out our Raspberry Pi WiFi tutorial for help with that. The Pi Wedge isn't quite required, but it does make life a lot easier. If you want to skip the breakout, you can instead use Male-to-Female jumpers to connect from Pi to breadboard. Of course, feel free to swap in your preferred button and LEDs. This tutorial will assume you have Raspbian installed on your Raspberry Pi. Raspbian is the most popular, well-supported Linux distribution available for the Pi. If you don't have Raspbian set up, check out our Setting Up Raspbian tutorial before continuing down this rabbit hole. Pulse-Width Modulation -- You can use PWM to dim LEDs or send signals to servo motors. The RPi has a single PWM-capable pin. Light-Emitting Diodes (LEDs) -- To test the output capabilities of the Pi, we'll be driving a lot of LEDs. Switch Basics -- And to test inputs to the Pi, we'll be using buttons and switches. Pull-Up Resistors -- The Pi has internal pull-up (and pull-down) resistors. These are very handy when you're interfacing buttons with the little computer. Check out our Raspberry Pi video tutorials if you want a more visual introduction to the Pi! The Raspberry Pi offers up its GPIO over a standard male header on the board. Over the years the header has expanded from 26 pins to 40 pins while maintaining the original pinout. If you're coming to the Raspberry Pi as an Arduino user, you're probably used to referencing pins with a single, unique number. Programming the Pi's hardware works much the same, each pin has its own number...and then some. There are (at least) two, different numbering schemes you may encounter when referencing Pi pin numbers: (1) Broadcom chip-specific pin numbers and (2) P1 physical pin numbers. You're usually free to use either number-system, but many programs require that you declare which scheme you're using at the very beginning of your program. This table shows the Pi pin header numbers, element14 given names, wiringPi numbers, Python numbers, and related silkscreen on the wedge. Note: The Broadcom pin numbers above relate to Pi Model 2 and later only. If you have an older Rev1 Pi, check out this link for your Broadcom pin numbers. As you can see, the Pi not only gives you access to the bi-directional I/O pins, but also Serial (UART), I2C, SPI, and even some PWM ("analog output"). To get a head start you can assemble the circuit now. We'll use this setup for both the C and Python examples. We'll use two LEDs to test the output functionality (digital and PWM), and a button to test the input. Our two LEDs are connected to the Pi's GPIO 18 and GPIO 23 -- those are the Broadcom chip-specific numbers. If you're basing your wiring off the P1 connector pin numbers, that'd be pins 12 and 16. The button is connected to Broadcom GPIO 17, aka P1 pin 11. If you don't have a Pi Wedge, male-to-female jumper wires help to make an easy transition from Pi to breadboard. 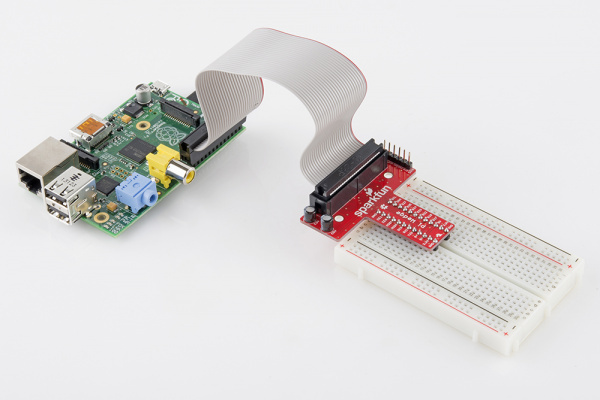 We'll use the RPi.GPIO module as the driving force behind our Python examples. This set of Python files and source is included with Raspbian, so assuming you're running that most popular Linux distribution, you don't need to download anything to get started. On this page we'll provide an overview of the basic function calls you can make using this module. That statement "includes" the RPi.GPIO module, and goes a step further by providing a local name -- GPIO -- which we'll call to reference the module from here on. GPIO.BOARD -- Board numbering scheme. The pin numbers follow the pin numbers on header P1. GPIO.BCM -- Broadcom chip-specific pin numbers. 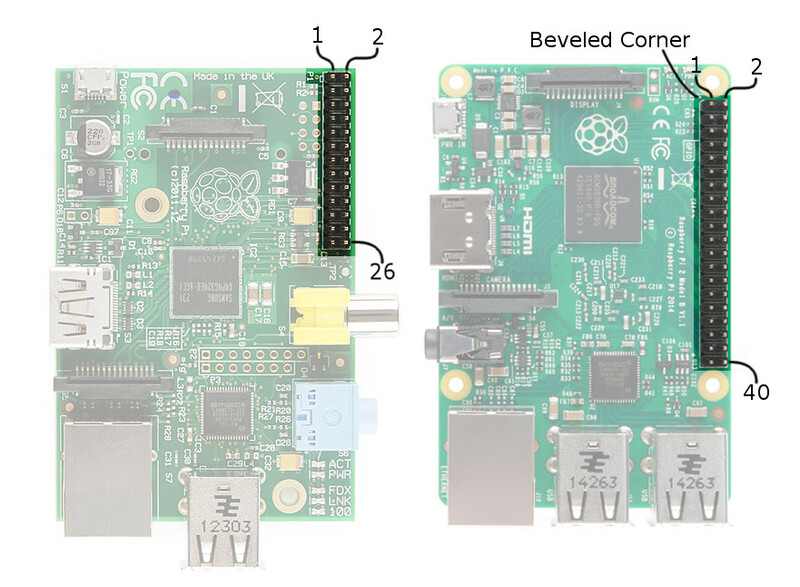 These pin numbers follow the lower-level numbering system defined by the Raspberry Pi's Broadcom-chip brain. If you're using the Pi Wedge, we recommend using the GPIO.BCM definition -- those are the numbers silkscreened on the PCB. The GPIO.BOARD may be easier if you're wiring directly to the header. ...will activate the Broadcom-chip specific pin numbers. Both the import and setmode lines of code are required, if you want to use Python. Remember that the pin number will change if you're using the board numbering system (instead of 18, it'd be 12). Writing a pin to GPIO.HIGH will drive it to 3.3V, and GPIO.LOW will set it to 0V. For the lazy, alternative to GPIO.HIGH and GPIO.LOW, you can use either 1, True, 0 or False to set a pin value. PWM on the Raspberry Pi is about as limited as can be -- one, single pin is capable of it: 18 (i.e. board pin 12). ...will set our PWM pin up with a frequency of 1kHz, and set that output to a 50% duty cycle. To turn PWM on that pin off, use the pwm.stop() command. Simple enough! Just don't forget to set the pin as an output before you use it for PWM. ...will read pin 17 and print whether it's being read as HIGH or LOW. 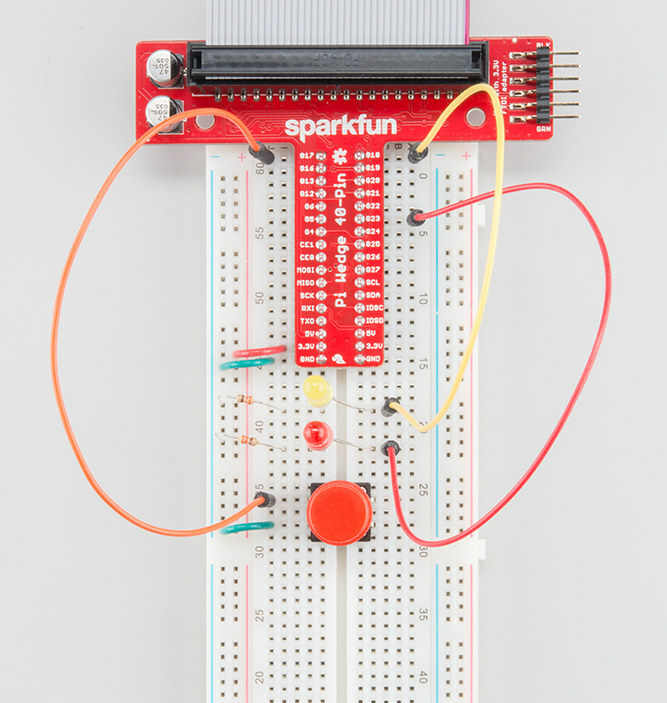 Remember back to the GPIO.setup() function where we declared whether a pin was an input or output? There's an optional third parameter to that function, which you can use to set pull-up or pull-down resistors. To use a pull-up resistor on a pin, add pull_up_down=GPIO.PUD_UP as a third parameter in GPIO.setup. Or, if you need a pull-down resistor, instead use pull_up_down=GPIO.PUD_DOWN. If nothing is declared in that third value, both pull-resistors will be disabled. The time module includes all sorts of useful functions, on top of sleep. Check out the reference here. Once your script has run its course, be kind to the next process that might use your GPIOs by cleaning up after yourself. Use the GPIO.cleanup() command at the end of your script to release any resources your script may be using. Your Pi will survive if you forget to add this command, but it is good practice to include wherever you can. Now then. Lets incorporate everything we learned here into an example script to try everything out. Follow along as we use the basic RPi.GPIO functions from the last page to create a simple example GPIO script. Create a file -- we'll call ours "blinker" -- and terminate it with a .py extension. Then open it up in your favorite text editor. Nano works, as does Pi's default GUI text editor, Leafpad. That'll open up a blank text file (the "&" will open it in the background, leaving the terminal in place for future use). Time for some code! Here's an example sketch that incorporates everything we learned on the last page. It does a little input and output, and even handles some PWM. This assumes you've set up the circuit as arranged on the Hardware Setup page. After you've typed all of that in (don't forget your whitespace!) save. With the code running, press the button to turn on the digital LED. The PWM-ing LED will invert its brightness when you press the button as well. Press CTRL+C to cleanly exit the script. 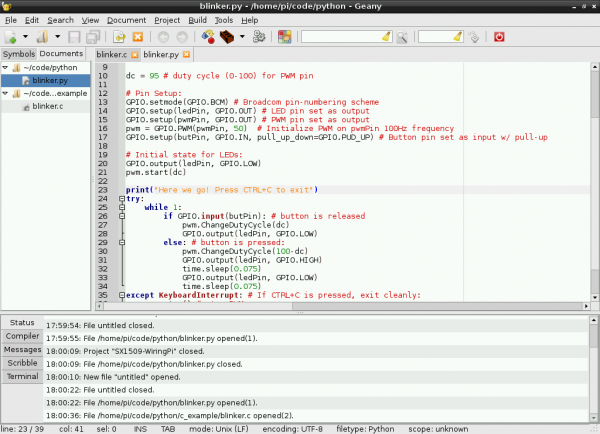 Python is a great GPIO-driving option, especially if you're used to it. But if you're a rickety old programmer, unfamiliar with the whitespace-driven scripting language, and would rather live within the happy confines of C, then let me introduce the WiringPi library. WiringPi is not included with Raspbian, so, to begin, you'll need to download and install it. That means your Pi will need a connection to the Internet -- either via Ethernet or WiFi. Once your Pi is Internet-enabled, visit the WiringPi homepage for instructions on downloading and installing the library. WiringPi is awesome because it's actually more than just a C library, it includes a command-line utility as well! You can test your installation of WiringPi with the gpio utility. As long as your LED is still connected to pin 18 it should blink on and off following the last two commands. Either 0 or 1 will be returned, depending on whether the button is pressed or not. Try typing that last line again while pressing the button. The gpio utility, as stated in the manual, is a "swiss army knife" command-line tool. We highly recommend checking out the man page (type man gpio) to discover everything it can do. If you're ready to get on with some C-style programming, head over to the next page. We'll overview some of the most useful functions provided by the WiringPi library. On this page we'll discuss some of the most useful functions provided by the WiringPi library. It's tailored to look a lot like Arduino, so if you've done any Arduino programming some of this may look familiar. wiringPiSetup(); // Initializes wiringPi using wiringPi's simlified number system. WiringPi's simplified number system introduces a third pin-numbering scheme. We didn't show it in the table earlier, if you want to use this scheme, check out their pins page for an overview. To set a pin as either an input or output, use the pinMode([pin], [mode]) function. Mode can be either INPUT, OUTPUT, or PWM_OUTPUT. Keep in mind that the above example uses the Broadcom GPIO pin-numbering scheme. The digitalWrite([pin], [HIGH/LOW]) function can be used to set an output pin either HIGH or LOW. Easy enough, if you're an Arduino user. ...will set pin 18 to a duty cycle around 70%. ...will print the status of pin 22. The digitalRead() function returns 1 if the pin is HIGH and 0 if it's LOW. Need some pull-up or pull-down resistors on your digital input? Use the pullUpDnControl([pin], [PUD_OFF, PUD_DOWN, PUD_UP]) function to pull your pin. That comes in handy if your button pulls low when it's pressed. Or you can use delayMicroseconds() to get a more precise, microsecond-level delay. Now that you know the basics, let's apply them to an example piece of code. The intention of WiringPi is to make your I/O code look as Arduino-ified as possible. However keep in mind that we're no longer existing in the comfy confines of Arduino -- there's no loop() or setup(), just int main(void). Follow along here as we create an example C file, incorporate the WiringPi library, and compile and run that program. Using the terminal, navigate to a folder of your choice and create a new file -- "blinker.c". Then open that file in a text editor (Nano or Leafpad are included with Raspbian). The commands above will open your "blinker.c" file in Leafpad, while leaving your terminal functioning -- in-directory -- in the background. Here's an example program that includes a little bit of everything we talked about on the last page. Copy and paste, or write it yourself to get some extra reinforcement. #include <wiringPi.h> // Include WiringPi library! Once you've finished, Save and return to your terminal. Unlike Python, which is an interpreted language, before we can run our C program, we need to build it. That command will create an executable file -- "blinker". The "-l wiringPi" part is important, it loads the wiringPi library. A successful compilation won't produce any messages; if you got any errors, try to use the messages to track them down. The blinker program should begin doing it's thing. Make sure you've set up the circuit just as modeled on the hardware setup page. Press the button to blink the LED, release to have it turn off. The PWM-ing LED will be brightest when the button is released, and dim when the button is pressed. If typing all of that code in a bland, black-and-white, non-highlighting editor hurt your brain, check out the next page where we introduce a simple IDE that makes your programming more efficient. Thus far we've been using simple text-editors -- Leafpad or Nano -- to write our Python and C programs. So seasoned programmers are probably missing a whole lot of features assumed of even the most basic editors: auto-tabbing, context-highlighting, even automated building. If you want to incorporate any of those features, we recommend using an IDE (integrated development environment). 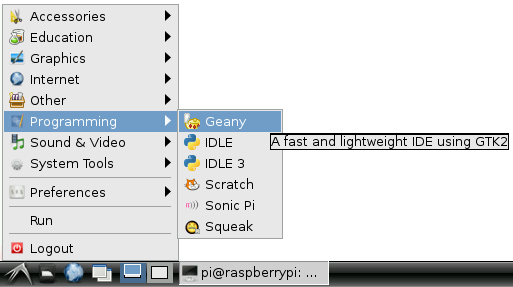 One of our favorite Pi IDE's is Geany, here's how to get it up and running. Once installed, you can run Geany by going to the "Start" menu, and looking under the "Programming" tab. Or, from the terminal, you can type sudo geany. You can even open a file in Geany, directly from the command line. To open our previous C file, for example, type sudo geany blinker.c. Once Geany is running, you can create a new file by going to File > New. Saving the file as either ".c" or ".py" (or any other common language file extension) will immediately inform Geany what kind of language you're working with, so it can start highlighting your text. Geany can be used with most languages, including the Python and C examples we've just examined. Some tweaks to the default IDE options are necessary, though. Here's an overview of using Geany with each language. Let's recreate our WiringPi Example with Geany. Open the "blinker.c" created earlier within the confines of Geany. You should immediately be presented with some very pleasant color-coding. Before trying to compile the code, though, you'll need to tweak some of the build options. 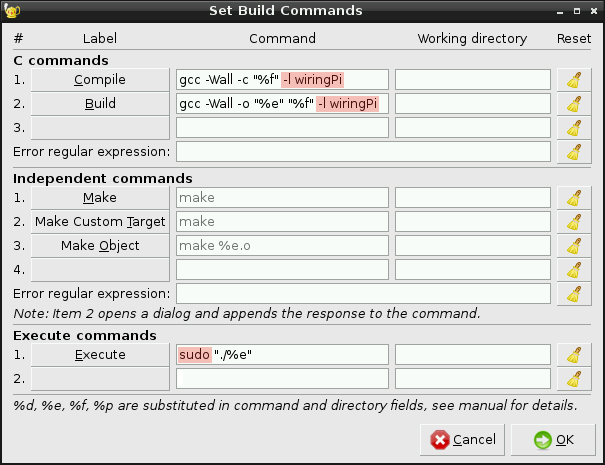 Go up to Build and Set Build Commands. Inside the "Compile" and "Build" text blocks, tack this on to the end of the default command: -l wiringPi. That will load the wiringPi library. While you're here, add "sudo" to the beginning of your execute command. Make sure your build commands look like the window above and click "OK". Once you've adjusted that setting, you should be ready to go. Click the Build menu, then click Build (or click the red cinder-block-looking icon up top). Upon building, the IDE will switch focus to the bottom "Compiler" tab, and relay the results of your compilation. If the build was successful, go ahead and run with it. To run your built file, click Build > Execute (or click the gear icon up top). Executing will bring up a new terminal window, and start your program running. You can stop the program by pressing CTRL+C in the terminal window. You can also use Geany with Python. To test it out, go ahead an open up the "blinker.py" file we created earlier. As with the C file, you'll be greeted with some pleasnt context highlighting. No building required with Python! Once you're script is written, simply click the "Execute" gear up top. Again, running will produce a separate terminal to pop up. To exit, simply press CTRL+C. Geany has tons of features beyond what we've covered here. Check out the tabs at the bottom. Check out the menus up top. Experiment and see how the IDE can make your programming life easier! RPi Low-level peripherals -- A Wiki with tons of details on using the Raspberry Pi's GPIO peripherals. WiringPi Hompeage -- The home of WiringPi and a variety of other Raspberry-Pi-related tools. Check it out! RPi.GPIO Homepage -- Home of the Raspberry Pi GPIO python module. Great source for API and documentation. Raspberry Pi Twitter Monitor -- How to use a Raspberry Pi to monitor Twitter for hashtags and blink an LED. Getting Started with the BrickPi -- How to connect your Raspberry Pi to Lego Mindstorms, using the BrickPi.